If you home school, how much time and thought do you devote to teaching physical education? Not soccer, football, baseball, sailing, or other evening/weekend sports but P.E. as part of your standard curriculum? My answer is "none". I teach reading, writing, arithmetic, science, history, and all that, but P.E. is so very different and out of the traditional curriculum box that I've never considered adding it as a scheduled subject. And I don't think I'm alone. When I was asked to review Alpha Omega Publications Horizons Physical Education Grades PreK-2 I was very intrigued, and was curious to see if this would be a guidebook I could use to add P.E. to our school week. True confession - I am not a naturally athletic person and was the kid picked last for teams in gym class - I have no clue how to teach P.E., especially not how to make it fun and educational! The large physical book arrived in the mail, all 440 pages of it. The interior pages are black and white, with some drawings and diagrams but no pictures. This book is definitely a teaching manual and feels serious and "textbook"; it took me a little while to warm to the book because it isn't cute and fun, but this big book is full of knowledge and I felt like I got an almost free full semester of an early childhood physical education college course. Once i got into it I really got into it. Physical Education Grades PreK-2 is Christian based. The book begins by explaining how educating the body through physical education relates to Christianity; how the task of physical education is to put into practice the principles we teach children - honesty, kindness, respect, discipline, and unselfishness - through physical activity. Would you benefit from this book and curriculum if you're not teaching from a Christian perspective? Yes, you'd just have to glean over a few of the sections and pick and choose what works for your family. The next chapters break down physical education curriculum by grade (preK/K, 1st, 2nd) beginning with goals (complete with references to pages in the chapter to meet those goals) and moving on to what and how to teach to reach those goals. As an example, one goal for a first grader is to work on motor proficiency for a variety of skills, including jumping. The section begins by explaining the components of a good jump; feet together, deep crouch, swinging arms, trunk is propelled at a nearly 45' angle, thighs extend nearly parallel to the ground during flight, arms remain high, body weight is forward at landing. Suggestions are then given to teach and learn the jump; ask students to stop and get ready between jumps, have students wave after jumping, have class members pretend their feet are glued together and can't come apart, work on the timing of the arm swing with a chant "The arms swing first to show the feet which way to go". Nine different practice activities are given that will help focus on jumping including jumping over ropes, have students jump over a moving rope, standing broad jumps, and a Thai game called KHAM HUAY in which a tiger has to jump over five kind of lakes without touching them (complete with diagram describing what to do at each lake). Following the curriculum for each chapter is a section devoted to implementing the core values through games and discussion, a section integrating physical education into other school subjects, and a very detailed model teaching sequence with monthly and daily plans. The book ends with an evaluation chapter, providing numerous ways to measure the child's performance in P.E. Ok, I know that's a lot of description, but like I said before this book is full of knowledge, I don't feel like I'm doing it justice if I don't mention most of what's in it. River (age 6) and I worked on the first grade curriculum in the book. We worked a few days a week at it, about thirty minutes a day, and he really enjoyed it, as did I. We found some areas he needed to improve in and we worked a little harder on those. Because I'm a reluctant exerciser myself (I do my 30-45 minutes a day but many days I have to really push myself) I appreciate that the book gives me more logical, legitimate reasons to exercise than just "because it's important". We'll be using the book as we begin our school year next Monday and it will be on our schedule. I'm also looking forward to incorporating some of the activities ideas into our Cub Scout pack this year. No, P.E. won't specifically become part of our program but coordinating some of the games with the values we're working on will be a lot of fun, help with our goals, and wear the kids out (seriously, these boys have more energy than a power plant). 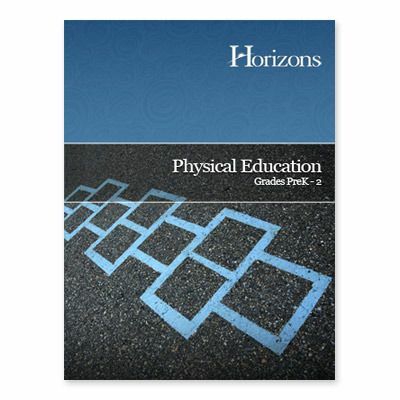 Horizons Physical Education Grades PreK-2 is available from Alpha Omega Publications for $40.95. To read more reviews on this and many other AOP products click the image below.